Recently I bought a rain sensor for hooking it up to my arduino. I have a home garden and watering it in my area is troublesome. I live in an area where we get unexpected rains. So I wanted to make a system that would check for rain on all times and alert me whenever it rains. The system notifies me on my mobile and shows the intensity of rain on my screen. Rain sensors are used in the detection of water beyond what a humidity sensor can detect. 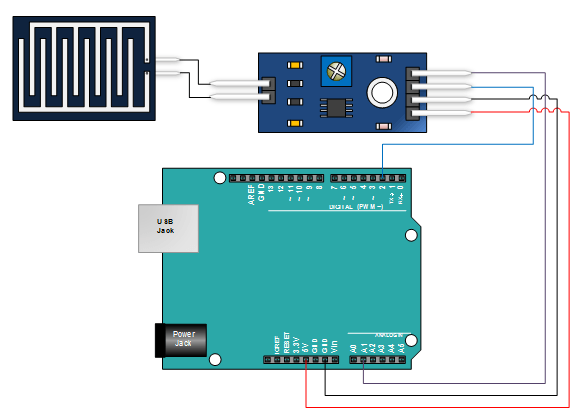 The rain sensor detects water that completes the circuits on its sensor boards' printed leads. The sensor board acts as a variable resistor that will change from 100k ohms when wet to 2M ohms when dry. In short, the wetter the board the more current that will be conducted.